Envoking the flavours of a Chicago-style hotdog, this Windy City inspired Bloody Mary is a delightful taste of America. Best finished with a suitably over-the-top garnish. Stir the poppy seeds and a pinch of the celery salt on a flat plate. Rub lemon wedge around the rims of two glasses to cover in juice. Dip the rims of the glasses into the poppy seed mixture to coat. Place the gherkin slices into the glasses and fill with ice. Stir the vegetable juice, vodka, mustard, pickle juice, onion and remaining celery salt in a cocktail mixer or jug. Season to taste. Pour the vegetable juice mixture into the glasses. 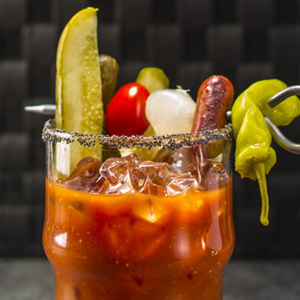 To go full Chicago style, garnish your Bloody Marys with skewers of Chicago-style favourites, such as cherry tomatoes, pickled jalapenos, gherkins, grilled chorizo and/or cocktail onions.